Why are you looking so scared? Are you scared that this dumb beast no longer seems so dumb after all or the fact that it is speaking an uncomfortable truth that you dare not face? Confront thyself, human! You will find a monster scarier than the most terrifying tiger! Anyways let me get to the point. I have something important to say to you. So where do I start? Ok. I am feeling sick and lonely. I have lost my will to live. I am dying. I am but a feeble reflection of my glorious ancestors of the wild. Generations of interbreeding within a small group in confinement has been acting like slow poison. Genetic defects have accumulated slowly but steadily stealing away the vitality of our race. And here you have before you in this cage all that remains of the glorious tiger race! And it won't be long before I would be gone too. With my death, you Indians will share a proud honor with your neighbors – the Chinese: a mythological beast as the country mascot! My race shall forever leave the realms of reality and join unicorns and dragons in mythologies and folklore. Well. That was some tale of woe, eh? Have I touched a raw nerve here ? Don't bother to answer! I no longer have any use for your sympathy. Keep your sympathies for your fellow humans. They will need it more than me. This was not the message I had for you anyways. I just felt like bitching about life. That’s it. You humans do it all the time, don’t you? Even when everything is going fine! Are you even listening to what I am saying? You look lost somewhere! Something bothering you? Guess I know what is troubling you. Your still wondering how is that I am able to speak. Am I right? Unless I first clarify that, I guess whatever I say is going to fall on deaf ears. So here goes. One day your Goddess ‘Durga’ came in my dreams and offered me a boon for the services my race had rendered her as trusty steeds. I could have asked for the resuscitation of our race. But then we have had enough of this game. I am sure the next time you humans will drive us to extinction even faster than last time, won’t you? We are not playing this game anymore. What I really desired was that the last tiger shall not die a dumb beast unspoken for. So I requested Goddess Durga to confer on me an ability to communicate in humans language so that I can give you humans a parting gift as I pass into oblivion: a few words of wisdom from a dying race. Now listen carefully as I give you my first message. ‘Claim your share of Mother Nature’s bounty but do not be covetous’ We tigers demarcate our hunting territories and do not encourage transgressions of boundaries. But I have never known a tiger to wage a war on tigers of neighboring territories to expand its territory. The only tiger that enters another’s territory is one that has no territory of its own and he does so for his survival not out of greed to possess all. But you humans have always been trying to endlessly increase your possessions and in the process you have wiped out not only us and other animal races but also a few human tribes like the Bushmen and the Red Indians. If you continue this way, you will be your own nemesis and in your insatiable greed, destroy each other . You still have not got the full import of my first message, have you? But my time is running out. So I need to move on to my second message. 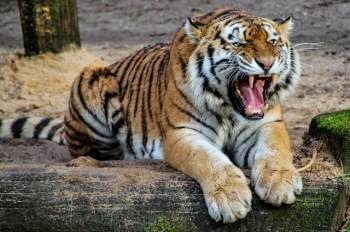 “Violence might be a means to an end, but should never be an end in itself” We tigers do hurt and kill other animals and sometime even humans. But we kill only for food or self preservation. We hold no malice towards those that we kill nor do we ever kill for mirth. Nature in its scheme of things has given us the role of the predator to regulate the population of herbivorous beast and we just play our part. You humans on the other hand seem bent upon making violence an end in itself. Human society seems so full of malice not only towards other beings but towards its own members. And this malice is not restricted to an individual level, is it? I am amazed at your ingenuity in creating so many groups for spreading hatred: country, caste, creed, color and class! However, what I find even more disturbing than malice is your love for violent forms of entertainment from times immemorial. You had gladiatorial fights and animal circuses in ancient times. You were into bullfights, cockfights and hunting in the middle ages. Now you have violent movies and even your young are taught to enjoy violence through violent computer games. With all this malice and love for violence, I can imagine it would only be a matter of time before your race brings itself to a violent end. And now my final dying words “Eat, drink and make merry but not excessively so as to upset nature’s balance”. We tigers have our share of food and drink, of rest and mating. But even without devising complex measurement systems and devices like you humans, we know how much of each we need and we take just that much. Every animal in the jungle knows a tiger that has just eaten is a totally harmless beast. We sleep after a tiring hunt and are up again in time for the next hunt. We mate just once a year for the continuity of our race. And you humans! What do you do? You seem to have perfected the art of taking everything to its extreme! You eat even when you are not hungry! You rest even when you are not tired! And you never seem to have enough of mating unlike the tiger of the woods (not human Tiger Woods) who only mates to procreate his race. No wonder you suffer so many diseases. I never knew a tiger with diabetes or heart ailments. Your diseases are nature’s way of restoring the balance you upset with your excesses. If you keep indulging in excesses, nature will have no choice but to completely eliminate you. I shall say no more for I am but a tiger: not a human spiritual Guru. We usually talk less, hunt more. But then we tigers do not want to be remembered just for our skin and claws and teeth that you killed us for. So I leave behind this important warning. Heed and you shall inherit all of Mother Nature’s wealth and enjoy for ages to come. Ignore at your own peril! As I get ready to depart your world, I summon my feeble body to give one final roar reminiscent of those glorious tigers of the yore, a true tiger to my last breath. Adieu, my friends. Roar! Roar! Youe outstanding post has captured the insatiable, suicidal greed of humans magnificently. I liked the ingenuity with which you have pulled off the trick. It should be an eye opener the fate of the wildlife in general, the tigers in particular. Thanks Suresh. I agree with what you say. Thats the sad part.